A few weeks ago I was interviewed by a young woman who was doing research on Hindu/Christian couples for a paper she was working on at the Harvard Divinity School. She had found me through some of my blog postings on negotiating different religious territory for our wedding. I admit that I am probably not the best “Christian” to interview for such a paper, for even though I was raised in a Catholic home, I don’t really consider myself very Christian. I was upfront about this in the interview, but the interviewer said that it was okay, that it was good to hear a diversity of opinions. I always mean to write a more in-depth post about my own feelings on religion. I have touched on some here and there, but sometimes I’m afraid of offending more religious readers of this blog. I wouldn’t mean to as I actually find religion a fascinating topic, but sometimes I worry that professing no faith can seem insulting or sad to those that have deep faith. Yet personally, I’ve never really felt any religious or spiritual stirrings. Perhaps not everyone is struck with a deep religious calling, but I haven’t even felt minor religious or spiritual murmurs. It’s not for a lack of wanting to, or having tried to seek such feelings out. There was a time when I really just wanted to “get” what other people seemed to, without having to try so hard. However it hasn’t happened, and on an intellectual level, at least with the Catholicism that I was raised with, Christianity just never made much sense to me. So it felt kind of cathartic to talk to this woman about my religious feelings (or lack there of), and how it shaped our multicultural household. As we neared the end of our hour long conversation she asked me if I ever had something close to a spiritual feeling even if I wouldn’t necessarily label it such, and I had to admit there was at least one time. It sounds like the biggest cliche in the book, but when I signed up to study in India I had been grappling with my complex religious feelings for years. Although the main purpose of my trip was to learn more about South Asia in general, I was hoping that perhaps something in this “spiritual land” (sorry, even I’m cringing as I write that) would speak to me, and that perhaps I’d finally find that missing religious link I’d been searching for. I didn’t, I came back just as atheist as I was when I departed, but there was one experience that felt inspiring, that did churn something up in my chest. I pulled out my India journal to see what I had written. As our program director was a Tibetan monk, our India semester had a special focus on Buddhism, and in addition to learning about Hindu culture and traveling to places like Varanasi, we also traveled to Dharmsala (where the Tibetan government-in-exile and the Dalai Lama reside) and Bodhgaya, the place where Buddha supposedly sat underneath the bodhi tree and meditated until he gained enlightenment. The town of Bodhgaya is off the regular tourist track, and although you do bump into western tourists, a lot of the visitors are Buddhist pilgrims from around the world, and particularly from Tibet. It wasn’t uncommon to see nomadic Tibetan pilgrims walking down the street looking like they had just stepped out of a National Geographic documentary on life in a yak caravan. Bodhgaya itself is a bit of a dusty backwater with frequent power cuts, and not much traffic. Around the outskirts of town are various temples from different Buddhist nations, built to reflect each culture’s style and architecture: Vietnam, Burma, Cambodia, Sri Lanka, Laos, Thailand, Nepal, Bhutan, etc. 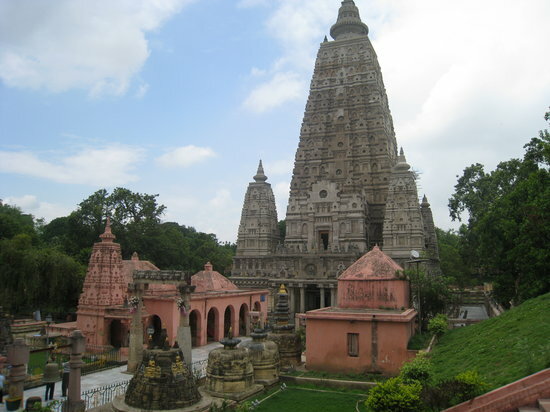 At the center of town is the Mahabodhi Temple, which sits beside the spot where Buddha meditated. A bodhi tree is still in the spot, supposedly the sapling of a sapling of a sapling of the original tree. Around the temple and the tree is a path that pilgrims circumambulate night and day. After being here and watching activites such as this, I feel like I could do something crazy and seemingly impossible. Like walk across the US, or do anything I set my mind to do. It would almost be a test of wills, just to see if I could do it. Nothing seems impossible anymore. Your mind does funny things when you test it… like walking around a temple in a continuous circle at 5 in the morning for two hours. It starts to wander… and you think about life… I meditated on my feelings about religion, I thought about my family, and life after college. I tried to release some of the anger that I have kept bottled inside and tried to breath out my frustrations. This has been good for me, healthy. It’s easy to let life and routine get in the way of seeking out these really inspirational moments. I don’t know if I really felt something spiritual while walking around the temple, but I definitely felt something deeply that day, and it will be a moment I’ll never forget. This entry was posted in India, Religion and tagged Bodhgaya, Buddhism, Christianity, Feeling, India, Mahabodhi Temple, Religion, religious feelings, Travel. Bookmark the permalink. i was always curious to know why non-indians think that india is a spiritual land. I guess it is the stereotype. For some Christians I feel that religion has become compartmentalized in our lives… there is our daily routine, and then a time and place–perhaps an hour at church on Sunday–where we let ourselves be religious, and the rest of the time we aren’t. Now certainly there are American Christians who are always religious, but quite a few of the Christians I know fall into the first category. Conversely we see India– and of course not all Indians are this way, but it is what we see in books, movies, other media– where religion and daily life seem to go more hand in hand. Mothers pray at their home altars each morning, people walk to their local temple for other prayers, foreheads are adorned with tilaks most of the day. For people who have separated religion and daily life so much in their regular routine, such images seem very spiritual. I think another reason India seems like such a spiritual place is because of the diversity and visibility of religion. Of course we have a diversity of religion in the US as well, but the prevailing rhetoric is Christianity–which can also be diverse, but when compared to very different philosophies, like Hinduism, Islam, Buddhism, Jainism, etc, the visibility of this diversity also lends itself to making India seem like much more of a spiritual place than somewhere like the US. you mentioned one reason of your visit to india was to feel the spiritual connection. so were the above mentioned reasons also why you, personally thought india as a spiritual land? how did you get introduced to this side of india at the first place? But I did indeed think of India as a “spiritual” place before I left (whether because of the Beatles, or movies, or books)… And our abroad program was framed in a very religion-centered way: our program director was a Tibetan monk, and much of our “cultural studies” on the country had a religious piece to it– we went on field trips to temples or religious cities (Rishikesh, Varanasi, Bodhaya), we practiced daily meditation, we stayed in an ashram at one point, we read abridged versions of the Ramayana and Mahabharata. It was almost as if we were meant to go— Aha! India= spiritual! But I agree that there is a lot more to South Asia then just religion and spirituality, it’s just that for Westerns it seems hard to divorce religion from culture when they think of South Asia–whether it is India and Hinduism, Sri Lanka and Buddhism, Pakistan and Islam, etc, etc, and I think a lot plays into why we are brought to that conclusion. the beatles! (and how they were among the first big western celebs to do the ‘spritual’ ashram thing in the 60’s right when alot of baby boomers were trying to find themselves as well – that i think plays in to it to solidify this image that india is very spiritual, and all that you said above…. interesting . and thanks for speculating. though i always had the notion that all underdeveloped or developing countries are usually more religious in day to day life. and one hypothesis is because they lack the strong institutions that the developed countries have.